Lighting up the night sky, a Delta 2 rocket roared to life and vaulted away from the Cape Canaveral Air Force Station late today, boosting a powerful space telescope into orbit around the sun for a $591 million mission to search for Earth-like planets orbiting distant stars. "I think people everywhere want to know whether, with all the stars out there, do they have planets that are Earth-sized?" said principal investigator William Borucki of NASA's Ames Research Center. "Are Earths frequent or are they rare? And this gives us that answer. It's the next step in mankind's exploration of the galaxy." The Kepler spacecraft's three-and-a-half-year mission began on time at 10:49:57 p.m. with a crackling roar and a torrent of fire that briefly turned night into day along Florida's space coast. Putting on a spectacular weekend sky show, the United Launch Alliance Delta 2 rocket quickly climbed from its sea-side launch pad and arced away to the east over the Atlantic Ocean as it streaked toward space. Just over one minute after launch, six solid-fuel strap-on boosters that were ignited at liftoff to assist the Delta's first-stage engine burned out and fell away while a final set of three ignited for another one-minute burn. The first-stage engine shut down as planned four-and-a-half minutes after launch and the ascent continued on the power of the Delta's compact second stage. Two second-stage burns were required before Kepler and its solid-fuel third stage motor were released for a final one-and-a-half-minute firing to boost the craft out of Earth orbit. Spacecraft separation came on time at 11:52 p.m. At that point, Kepler was moving out at a blistering 6.2 miles per second. 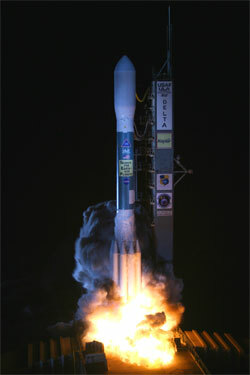 This was the 339th Delta rocket launched since 1960, the 141st upgraded Delta 2, and the 86th successful Delta 2 launch in a row dating back to January 1997. The Delta 2 record now stands at 139 successful missions against just two failures. "And now we have plenty of handshakes going on here in the mission director's center because we have confirmation of spacecraft separation," said NASA launch commentator George Diller. "It did occur on time at 61 minutes 49 seconds. ... So at this point, the Kepler team now really gets to work." Engineers will spend about two months checking out and calibrating Kepler's complex systems before the mission begins in earnest. Trailing the Earth in its orbit around the sun, Kepler will aim a 95-megapixel camera on a patch of sky the size of an out-stretched hand that contains more than 4.5 million detectable stars. Of that total, the science team has picked some 300,000 that are of the right age, composition and brightness to host Earth-like planets. Over the life of the mission, more than 100,000 of those will be actively monitored by Kepler. The spacecraft's camera will not take pictures like other space telescopes. Instead, it will act as a photometer, continually monitoring the brightness of candidate stars in its wide field of view and the slight dimming that will result if planets happen to pass in front. By studying subtle changes in brightness from such planetary transits - comparable to watching a flea creep across a car's headlight at night - and the timing of repeated cycles, scientists can ferret out potential Earth-like worlds in habitable-zone orbits. The probability of finding sun-like stars with Earth-like planets in orbits similar to ours - and aligned so that Kepler can "see" them - is about one-half of 1 percent. Given the sample size, however, that still leaves hundreds of potential discoveries. But it will take three-and-a-half years of around-the-clock observations to capture the repeated cycles needed to confirm detection of an Earth-like world in an Earth-like orbit. "There's a lot of desire in the science community to understand extra-terrestrial planets, not just find them," said Ed Weiler, NASA's associate administrator for space science. "We've already found 300 or so, mostly from the ground. But now we're entering the stage of going beyond just proving that they exist. It's how many are out there, and perhaps the most important question of all, are there any Earth's out there? "So far, even though we've discovered (more than) 300 planets, we haven't discovered any that are the size of the Earth in the so-called habitable zone, that is, a planet close enough to the star where it's warm enough for water to be liquid, not frozen, or not too close to the sun where it would boil off. So Kepler is going to be the first mission that starts to answer that question, are there any Earth's out there?" Named in honor of Johannes Kepler, the 17th century German astronomer who formulated the laws of planetary motion, NASA's newest science satellite weighs 2,320 pounds and measures 15.3 feet from top to bottom. It is equipped with four solar panels capable of generating 1,100 watts of power, a radiation-hardened PowerPC flight computer and a Ka-band communications link to relay science data back to Earth. The spacecraft was built by Ball Aerospace of Boulder, Colo.
Kepler will pass the moon's orbit in just two days as it heads into a 371-day orbit around the sun, separating slowly from Earth. It will aim itself at a patch of sky near the left wing of Cygnus the Swan, midway between the stars Deneb and Vega. And then, Kepler will simply stare at the same stars for three-and-a-half years. "An Earth-like planet passing in front of a sun-like star is going to cause the brightness of that star to dim by only 1 part per 10,000," said Natalie Batalha, a Kepler co-investigator at San Jose State University. "That's like looking at a headlight from a great distance and trying to sense the brightness change when a flea crawls across the surface. But the Kepler instrument is designed to detect such small changes in brightness." Kepler is capable of detecting Earth-like planets around stars ranging from 600 to 3,000 light years away. The science team is particularly interested in planets that may orbit within a star's habitable zone, the region around a star where water on a planet can exist as a liquid. Habitable zones vary in location depending on a star's size and brilliance. By timing changes in a star's light as a transit occurs, scientists can figure out the size of a presumed planet's orbit and thus whether it falls in that star's habitable zone. "The habitable zone is where we think water will be," Borucki said. "If you can find liquid water on the surface, we think we may very well find life there. So that zone is not too close to the star, because it's too hot and the water boils. Not too far away where the water's condensed and ice-covered, a planet covered with glaciers. It's the goldilocks zone, not too hot, not too cold, just right for life." Weiler said Kepler is a pathfinder of sorts for more sophisticated missions that may one day study the atmospheres of Earth-like planets to look for signs of biological - or even industrial - activity. "A lot of scientists out there would like to immediately go out and build very large telescopes, not just to find Earth-like planets but to study their atmospheres, to search for clues that there might be life on those planets," Weiler said. "The trouble is, most of these proposals start at about $5 billion and work upwards from there. "Before we actually take the next step, looking for signs of life on Earth-like planets, we've got to be sure there are at least a few Earth-like planets out there. And that's why Kepler is so important. It's a rather small mission, a moderate mission, around ($600 million), and it's really a pathfinder for future large space telescopes that will go after the question that we all have, are we alone in the universe?"